We take immense pleasure in introducing ourselves as one engaged in Pest Control Service with sound technical background and commitment to provide services. 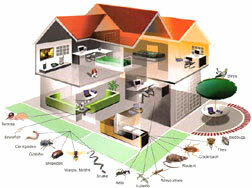 As you are aware general pests such as cockroach, termites , rats, rodent, silverfish, borer are source/barrier of various diseases. They contaminate food and cause diseases like Tuberculosis, cholera, typhoid, dysentery etc. In addition they cause extensive damage to property if not checked in time.